Following an enthusiastic turnout for Click Workspace’s first Click Music concert in January, the downtown Northampton coworking and events space announces its next concert for Thursday, February 23rd at 7:00 p.m., featuring local string virtuosi Zoë Darrow on fiddle and Stephen Katz on cello. Click Music invites audiences into its intimate performance space for up-close experiences as artists are given free reign to experiment with their music making. In that spirit, after playing their own sets, Darrow and Katz will come together for an unrehearsed, improvisatory collaboration. 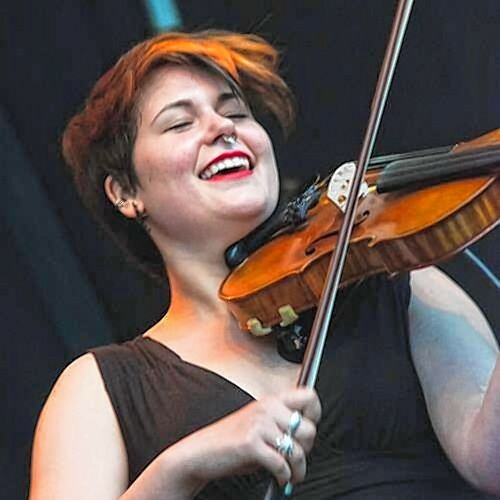 Zoë Darrow is an accomplished fiddler and musician of rare intensity and expressive range who grew up playing Cape Breton and other Celtic music on a sheep farm in Blandford. She released her first recording in 2001 at the age of 12, with her band the Fiddleheads. The Valley Advocate named them "Best Celtic Band” in 2007 and Celtic Heritage Magazine acclaimed Zoë as an artist “destined to add savory spice to the global mix.” Zoë has also become a much sought after collaborator, touring and recording with luminaries like banjo innovator Tony Trischka, Bela Fleck’s primary banjo guru. Her recent performances have showcased her hair-raising singing and songwriting. Cellist and award-winning composer Stephen Katz has charted new territory for the rhythmic potential of the cello with the groundbreaking approach he calls Flying Pizzicato. The results are compositions that juggle two or three voices at a time, making music that lays grooves, weaves tunes, and lifts spirits. The New York Times wrote, "With a bow and fingers as light as feathers, Stephen Katz makes a cello bring out meanings you might not have suspected were there." Stephen has performed his compositions at Carnegie Recital Hall and toured internationally. He has been featured on American Public Media national broadcasts of Performance Today, and is a National Endowment for the Arts grant recipient. He is also an award-winning film composer and an improviser and composer in the dance world. Tickets are available in advance for $10 via Eventbrite (service fees apply), and will be available at the door for $12 cash. Click Music is curated by Northampton-based musician and producer Anand Nayak and sponsored in part by Downtown Sounds. Concerts are held at Click Workspace, 9 ½ Market Street, Northampton. Complete information and tickets are available at http://clickworkspace.org/events.